Well. As I was preparing a job application at the library public wifi (the Airbnb I was staying at did not have wifi in my cabin, nor electricity for that matter), I prepared an interpretive poster for this earthquake. Interestingly, the library prevented any ftp connections, so I had to wait until today to upload my files. Note: not sure why, but when I prepared this report, I initially entitled it as being along the Tonga subduction zone. This was not correct and I fixed it. There was a recent earthquake along the Tonga subduction zone and I had that on my mind. 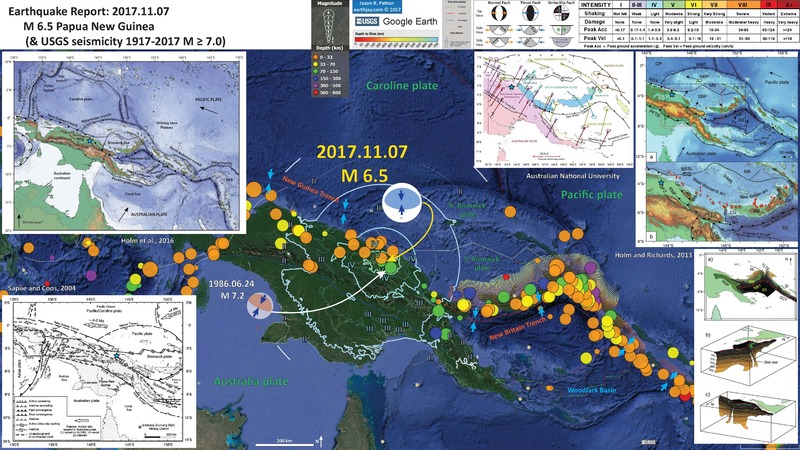 This M 6.5 earthquake (here is the USGS website for this earthquake) happened in a region of Papua New Guinea (PNG) that has a long record of different types of tectonic deformation (including subduction, strike-slip, and several fold and thrust belts). To the northwest, in 1998, there was an earthquake that triggered a submarine landslide, which generated a large, devastating, and deadly tsunami. Here is the USGS website for this 1998 M 7.0 earthquake. There are historic earthquakes to the west of this M 6.5 that are associated with the fold and thrust belt, but this M 6.5 earthquake is too deep to be associated with a possibly eastern extension of this fold and thrust belt. womp womp. However, there have been a few earthquakes that are more closely (spatially) related to the 2017.11.07 M 6.5 earthquake. On 1986.06.24 there was an M 7.2 earthquake (here is the USGS website for this earthquake) to the southeast. These two earthquakes both have similar fault plane solutions (a moment tensor for the 2017 earthquake and a focal mechanism for the 1986 earthquake) and nearly identical depths. These deep earthquakes are deeper than we would expect for a subduction zone fault, so are possibly related to internal deformation within the downgoing slab. The subduction zone associated with the New Guinea (NG) trench (associated with the 1998 landslide tsunami earthquake) may or may not extend into this region (The Holm et al. (2016) figure below shows it does now). There is a fossil subduction zone (the Melanesian or Manus Trench) to the east of the NG trench, but this is also probably unrelated. The best candidate is the downgoing slab associated with the New Britain Trench. 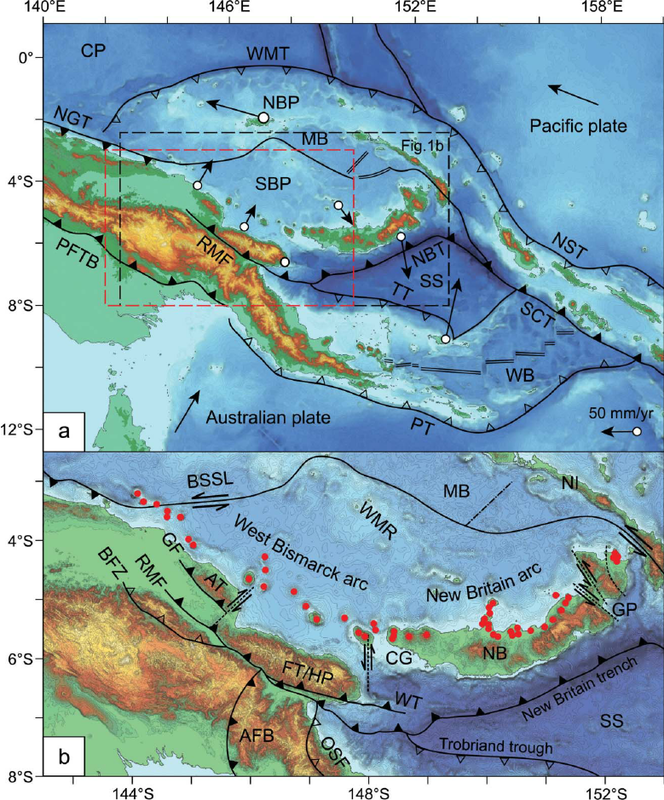 This subduction zone is formed by the northward motion of the Solomon Sea plate beneath the South Bismarck plate (in the region of New Britain), but to the west, this fault splays into three mapped thrust faults that trend on land in eastern PNG. This is the slab imaged beneath where the epicenters are plotted for both 1986 and 2017 earthquakes. The Holm et al. (2016) figure has an inactive splay that more optimally (geometrically) is suited to fit these two earthquakes. There is a figure in the poster (and plotted below) that shows the geometry of this downgoing slab. I plot the seismicity from the past month, with color representing depth and diameter representing magnitude (see legend). I include earthquake epicenters from 1917-2017 with magnitudes M ≥ 6.5. 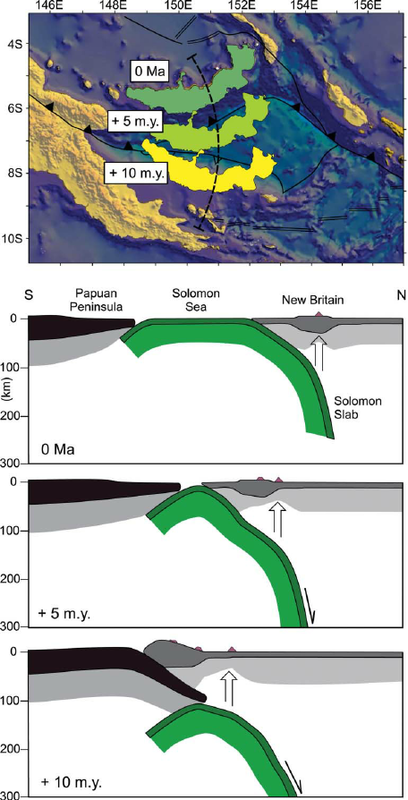 In the upper left corner is a great figure showing the generalized plate tectonic boundaries in this region of the equatorial Pacific Ocean (Holm et al., 2016). I place a blue star in the general location of the M 6.5 earthquake (also plotted in other inset figures). In the lower left corner is another plate tectonic map (Sapiie and Cloos, 2004) showing a slightly different interpretation of the faults in this region. In the upper right corner are two figures from Holm and Richards (2013). Their paper discusses the back-arc spreading in the Bismarck Sea. They use hypocenter data to construct this 3-D model of the slab. On the right is a forecast of how the slab will be consumed along these subduction zones in the future. In the lower right corner is another figure from Holm and Rihards (2013) where they present a low angle oblique view of the slab that they modeled in their paper. To the left of the Holm and Richards figure is a map only has plate motions plotted (from Paul Tregoning at The Australian National University). The map plots, “linear velocities of GPS sites in PNG, showing absolute motions of the numerous tectonic plates.” Go to his website where he presents some related papers. In 2015 there were a few small earthquakes to the northeast of the 1986 and 2017 deep earthquakes, but they were much shallower. However, they show a similarly oriented fault place solution. Though, these 2015 earthquakes are probably associated with the current strain being accumulated and released associated with plate tectonic boundaries (while the 1986 and 2017 deep earthquakes are not; their shared orientation is probably just coincidental?). Here is the report from 2015. Below is the interpretive poster for those earthquakes (note how my posters are seeing a realized improvement over time). Here is the tectonic map figure from Sappie and Cloos (2004). Their work was focused on western PNG, so their interpretations are more detailed there (and perhaps less relevant for us for these eastern PNG earthquakes). 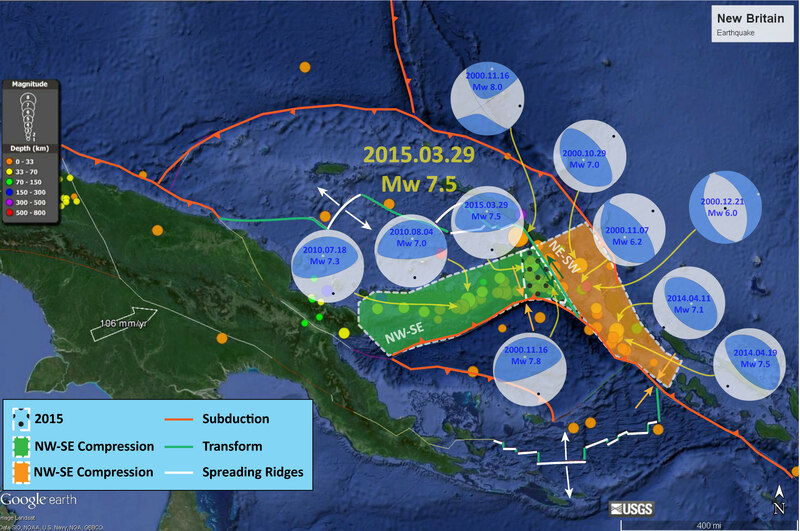 Seismotectonic interpretation of New Guinea. Tectonic features: PTFB—Papuan thrust-and-fold belt; RMFZ—Ramu-Markham fault zone; BTFZ—Bewani-Torricelli fault zone; MTFB—Mamberamo thrust-and-fold belt; SFZ—Sorong fault zone; YFZ—Yapen fault zone; RFZ—Ransiki fault zone; TAFZ—Tarera-Aiduna fault zone; WT—Waipona Trough. After Sapiie et al. (1999). 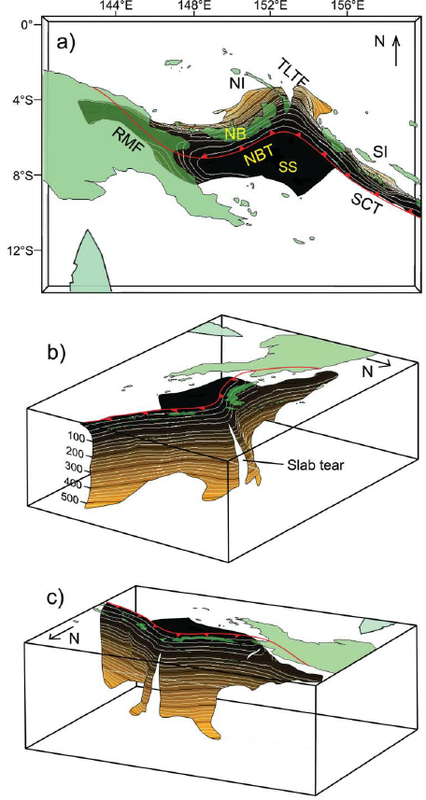 This is the two panel figure from Holm and Richards (2013) that shows how the New Britain trench megathrust splays into three thrust faults as this fault system heads onto PNG. They plot active thrust faults as black triangles (with the triangles on the hanging wall side of the fault) and inactive thrust faults as open triangles. So, either the NG trench subduction zone extends further east than is presented in earlier work or the Bundi Fault Zone is the fault associated with this deep seismicity. Topography, bathymetry and major tectonic elements of the study area. 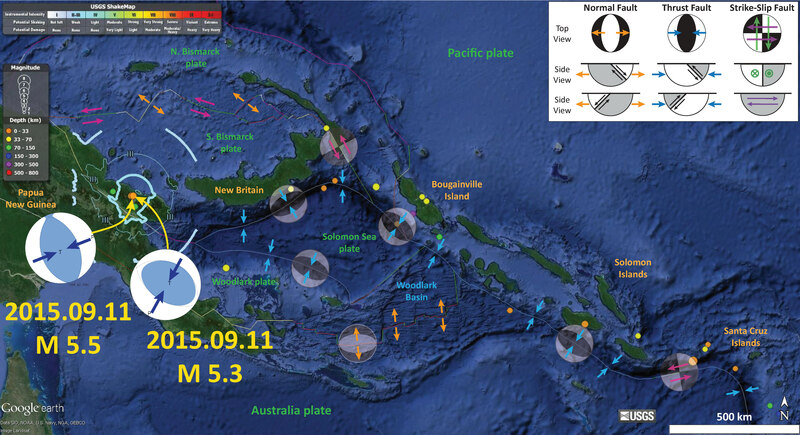 (a) Major tectonic boundaries of Papua New Guinea and the western Solomon Islands; CP, Caroline plate; MB, Manus Basin; NBP, North Bismarck plate; NBT, New Britain trench; NGT, New Guinea trench; NST, North Solomon trench; PFTB, Papuan Fold and Thrust Belt; PT, Pocklington trough; RMF, Ramu-Markham Fault; SBP, South Bismarck plate; SCT, San Cristobal trench; SS, Solomon Sea plate; TT, Trobriand trough; WB,Woodlark Basin; WMT,West Melanesian trench. Study area is indicated by rectangle labelled Figure 1b; the other inset rectangle highlights location for subsequent figures. Present day GPS motions of plates are indicated relative to the Australian plate (from Tregoning et al. 1998, 1999; Tregoning 2002; Wallace et al. 2004). (b) Detailed topography, bathymetry and structural elements significant to the South Bismarck region (terms not in common use are referenced); AFB, Aure Fold Belt (Davies 2012); AT, Adelbert Terrane (e.g. Wallace et al. 2004); BFZ, Bundi Fault Zone (Abbott 1995); BSSL, Bismarck Sea Seismic Lineation; CG, Cape Gloucester; FT, Finisterre Terrane; GF, Gogol Fault (Abbott 1995); GP, Gazelle Peninsula; HP, Huon Peninsula; MB, Manus Basin; NB, New Britain; NI, New Ireland; OSF, Owen Stanley Fault; RMF, Ramu-Markham Fault; SS, Solomon Sea; WMR, Willaumez-Manus Rise (Johnson et al. 1979); WT, Wonga Thrust (Abbott et al. 1994); minor strike-slip faults are shown adjacent to Huon Peninsula (Abers & McCaffrey 1994) and in east New Britain, the Gazelle Peninsula (e.g. Madsen & Lindley 1994). Circles indicate centres of Quaternary volcanism of the Bismarck arc. Filled triangles indicate active thrusting or subduction, empty triangles indicate extinct or negligible thrusting or subduction. This map shows plate velocities and euler poles for different blocks. I include the figure caption below as a blockquote.